Terrain began as a one-night visual arts and music event every fall and has since gradually grown into a thriving non-profit arts organization with a permanent location in the Washington Cracker Building and a strong influence on Spokane's cultural growth. 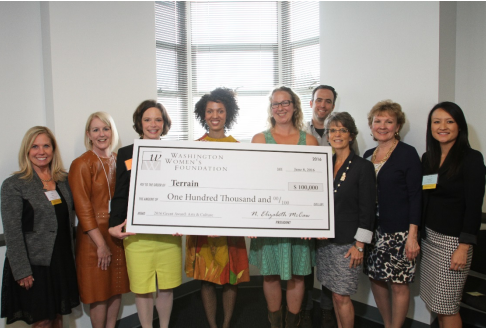 Now, it's likely we'll see even more from Terrain after the organization was awarded a $100,000 grant last night from the Washington Women's Foundation. Terrain was the first Spokane-based organization to receive a grant from the organization in its 21 years of awarding money throughout the state. "This organization and the young leaders involved made our hearts sing. Terrain has become the voice of the young artist in Spokane," said WWF President Beth McCaw in a statement. The money will be awarded to Terrain over the course of three years and and will be used to transition the organization from being strictly volunteer-run to having at least one paid employee. “There is no doubt in my mind, sometime down the road, when more of our story has been written, Terrain will look back at this evening, and recognize it as the moment we became something greater," said Terrain co-founder Ginger Ewing upon accepting the grant last night in Seattle. Bazaar, Terrain's downtown Spokane one-day art market, is set for June 18. Here are the event details.